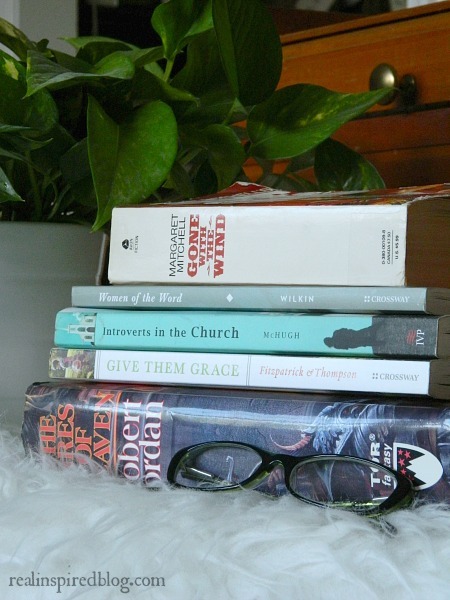 It's been a while since I shared my very first and last post on my current reads. Last time I was only reading one book. I think it was Harry Potter and the Deathly Hallows. This time I'm reading five. I've never been someone that reads several books at once. I'm still not. I'm actually not sure how it happened. I don't have a lot of time to read just one, which is probably why it's taking me so long to get through these. 1. Gone with the Wind: I've watched the movie and now it's time to read the book. That Scarlet though. I kinda want to slap her silly. 2. Women of the Word: This one is a "how to study the Bible" book. Not by focusing on separate verses or topics, but by interpreting the little stories in the light of the bigger story. The overarching story: God reaching down to man throughout the redemptive work of Christ. 3. Introverts in the Church: The title is rather self explanatory. Unfortunately, even in the church, introverts are not appreciated for the gifts they can give. They are put down for the ones they struggle with or can't give. How do introverts fit in the church? I'm interested to find out. I'm only a 1/4 of the way through it. 4. Give Them Grace: My favorite parenting book right now. I'm still working on grasping the concept of grace and, even though this book is about parenting, I feel like I'm learning a little bit more of what grace means through reading it. 5. The Fires of Heaven: The Fires of Heaven is the 5th book in the Wheel of Time series. Since Hubby and I are reading it together, I'm not really reading that one myself as much as listening to him read it. It's a great fantasy story! What are your current reads? I'm always looking for good books to add to my reading list!